from countless local, national, and international wine competitions. were selected winners, amongst 3200 wines from 22 countries. 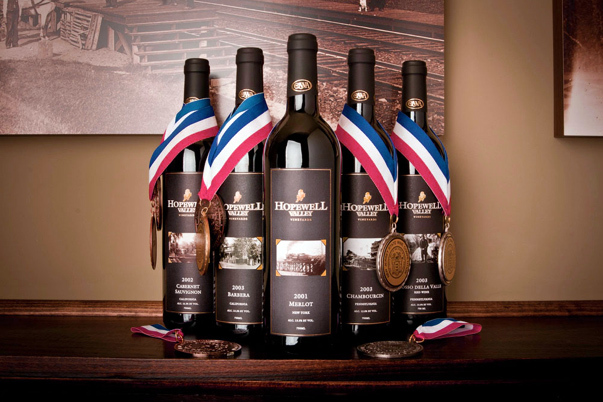 Other highlights include the prestigious New Jersey Governor’s Cup for our 2006 Chambourcin, and best in class awards, including our popular 2009 Merlot which scored 92 at the International Los Angeles Wine Competition. The New Jersey Wine Competition is organized by the Rutgers Cooperative Extension and the New Jersey Wine Industry Council and is judged by a group of prestigious judges including members of the Society of Wine Educators, the American Wine Society, representatives of the region’s largest commercial distributors and various wine industry publications. Entries were judged on individual varietal character and enological merit. The International Eastern Wine Competition (I.E.W.A.) is one of the country’s oldest and largest wine competitions and is sponsored by Vineyard and Winery Management Magazine. In 2004, they received entries from 16 countries, 34 states, and 3 Canadian Provinces. The Wine and Grape Juice Competition is sponsored by the Florida Grape Growers Association. The Finger Lakes International Wine Competition is open to commercial wineries from the US, Canada, and all wine-producing countries. In 2006, the event attracted more than 1700 wines from across the U.S. and around the globe. This event is the world’s largest charitable wine competition. All proceeds benefit Camp Good Days and Special Times, Inc. This not-for-profit organization is dedicated to improving the quality of life for children and families whose lives have been touched by cancer and other life-threatening challenges. The National Women’s Wine Competition judged over 1800 wines from 523 wineries from 31 states. Grand Harvest Awards Truly one of a kind! It is the only wine-judging event in North America that is based on terroir – a group of vineyards (or even vines) from the same region, belonging to a specific appellation, and sharing the same type of soil, weather conditions, grapes and wine making savoir-faire, which contribute to give its specific personality to the wine. The Atlantic Seaboard Wine Association (ASWA) is one of the oldest wine organizations located on the East Coast. Established in 1973 as the Vinifera Wine Growers Association (VWGA), it was an early supporter of planting world-class Vinifera wine grapes, the production of quality commercial wines, and the building of a wine industry along the Eastern seaboard.